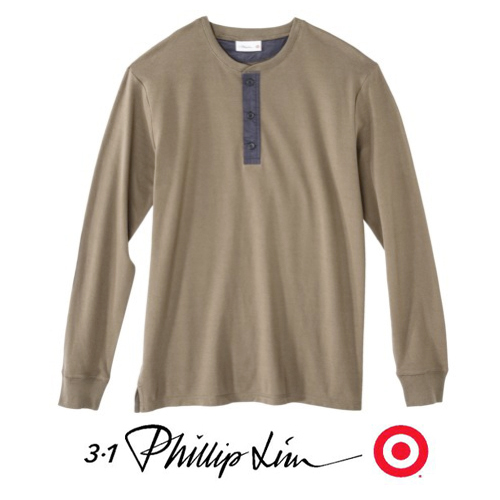 I have to confess that I forgot about the release of the 3.1 Phillip Lim for Target collaboration yesterday. I set my alarm on Saturday so that I wouldn't forget and then when the alarm rang, I couldn't remember why and I was upset because it was a Sunday. So instead of heading to Target like a good style blogger, I snuggled closer to my sleeping husband for another two hours of sleep. When I woke up, I ran errands and spent most of the day shopping for suits for the kids who will be ushers in a family wedding next month. And I still didn't remember. Not until last night when I was catching up on some blogs and Fran and Cid both mentioned it, that I finally remembered. Fortunately, nothing was sold out, except the handbags at the store I visited in Dallas after Pilates this morning. While I was really excited about the leather jacket and it was one of my favorite pieces, I cannot bring myself to spend $250 on a leather jacket at Target. I don't care what the label is, I can't. 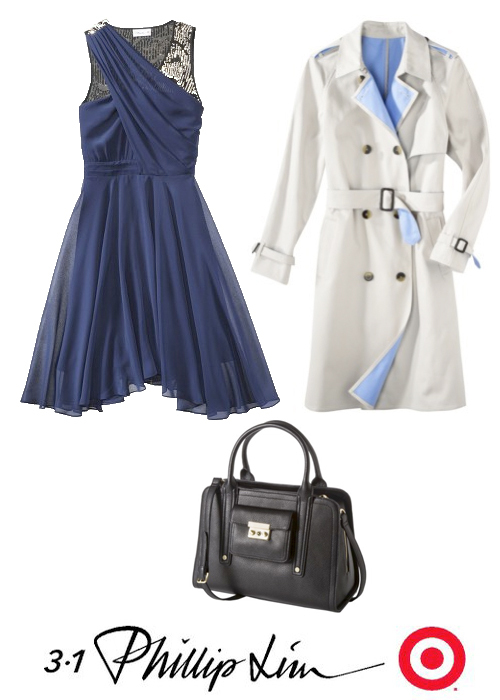 I tried on both the dress and the trench coat above at my local Target and I really wanted to love the dress because I thought it was a beautiful color and I wanted to wear it to the rehearsal dinner for the family wedding. 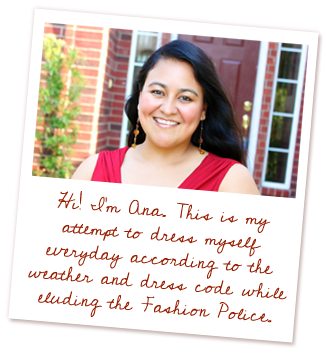 I had already imagined that someone would say, "I love your dress!" and I would casually reply, "Thanks! I got it at Target." But, I just couldn't bring myself to spend $75 on a dress that was clearly made of polyester. I wandered around the store for a good 30 minutes trying to talk myself into it, but the truth is that some of the other collaborations have spoiled me. This dress by The Webster for The Shops at Target cost $40 and it feels amazing and I get so, so many compliments on it. I love watching people's jaws drop when they ask where I bought it and I say, "I picked it up at Target last year." This dress by 3.1 Phillip Lim just doesn't have that oomph. The fabric felt and looked cheap and at the end of the day I knew that it would hurt to add $75 to my budget this month for a dress I didn't love. The coat was also disappointing because in the photos, it looks like the blue fabric is the lining of the coat, but it is not. The coat is unlined and is simply khaki on the outside and blue on the inside. This was the item I would have bought, but I would have needed at least $40 in alterations if not more because I would have needed to take in the sleeves and take up the hem a couple of inches. I also tried the grey terry sweatpants, but being a short, hippy girl with a stomach pouf did me no favors and I just looked awful. In the end, I passed on all the clothes and was left only hoping for store returns on the purses as was the case with the Neiman Marcus collaboration because I've heard ridiculously great reviews of the handbags which were sold out at my store. What did I bring home? A shirt for our 16-year-old. I loved the henley style and I think it will be perfect for those California evenings in Napa Valley next month when the temperatures drop enough to give a chill, but not enough to warrant a full coat. He loved it and I had no problem paying $23 for 95% cotton and 5% spandex. I actually liked the men's selection and if my husband wasn't 6'5" I might have picked him up a couple of pieces, too. Those all looked and felt much better and the pricing was surprisingly spot on. 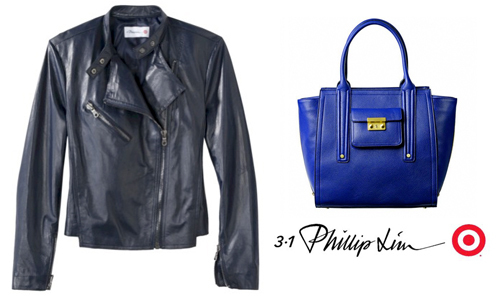 Did you get to check out the 3.1 Phillip Lim for Target Collection? What did you buy? What did you like? What did you not like? I could shop only at Target and be totally fine with it! Loving these picks.